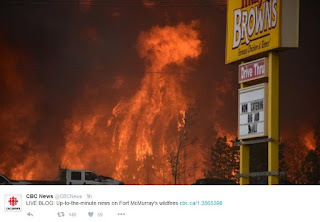 Since it is being well covered in the media, I haven't posted about the horrific wildfire around - and evacuation of well over 50,000 residents from - Fort McMurray, Alberta. According to NBC News, however, this is the largest wildfire evacuation in Alberta's history (see Fort McMurray Wildfire: 60,000 Evacuated Over Out-of-Control Blaze). While firefighters are working to contain this blaze, homes and businesses have already been destroyed, and authorities fear the worst is far from over. Although the Alberta fire falls on the extreme end of the scale, every year we see thousands of instances where individual families, neighborhoods, long stretches of coastlines, and on rare occasions - even entire cities - are forced to leave their homes for their own safety. The causes may be as large as an out-of-control wildfire, a hurricane or tsunami - or something more localized like an industrial accident, rising flood waters, or even a house or apartment fire. While you and your family might get a day or two to prepare with an approaching hurricane, with many of these other threats, you may have only hours or minutes to gather your things and get out of Dodge. Regular readers know I very nearly had to `bug-out’ four years ago (see At The End Of My Rope), when the world came crashing down in the middle of the night, and fellow blogger Maryn McKenna described her close call from 2013 in The Risks You Don’t Think of: A Plea to Pack a ‘Go Bag’. And it could easily happen to you. Being able to leave in a hurry when an evacuation has been ordered means having a plan, a destination, and an emergency `to go’ kit or `BOB’ already equipped, and standing by. In the vernacular, a `bug-out bag' or `BOB’ (or sometimes GOOD bag for `Get Out Of Dodge’) a bag of emergency supplies, ideally kept at the ready, that one can grab on the way out the door during an emergency. Every hurricane season I go through my personal bug out bag, and replace flashlight and radio batteries from last year, and swap out older emergency rations for newer ones. A BOB isn't supposed to be a survival kit, but rather, is supposed to provide the essentials one might need during the first 72 hours of a forced, and sometimes unexpected, evacuation. It should contain food, water, any essential prescription medicines, copies of important papers (ID's, insurance, important Phone #s), a first aid kit, portable radio, flashlight, extra batteries, and ideally blankets and extra clothes. Luckily, I have several pre-arranged places I can go. Friends, who are also disaster buddies (see In An Emergency, Who Has Your Back? ), who know my couch is always available to them. Since I live in a hurricane evacuation zone, I have an emergency plan, a pre-arranged place to go, and my evac kit (see Inside My New Bug Out Bag) packed and ready to go. Of course, you’d be hard pressed to put everything for a family of four into one bag. So each family member should have their own BOB. Some items, like the radio, lights, and first aid kit needn’t be duplicated in each bag. I keep my BOB within arm’s reach of my first aid kit, and would hopefully be able to grab both, even in an emergency. On top of this, I keep a spare first aid kit in my car, along with an `overnight bag’, and I have a third duffel bag packed with extra supplies, that I would hopefully be able to throw in the car as well. 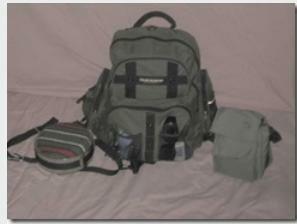 But if I had to, I could easily go 72 hours on just my bug-out bag alone. I do these things to give me peace of mind and confidence that I’m ready to deal with just about any emergency that comes my way. The truth is, preparing is easy. It’s worrying that is hard.